I saw this image somewhere earlier this month. It immediately struck a chord with me, but not in the manner the creator probably intended. 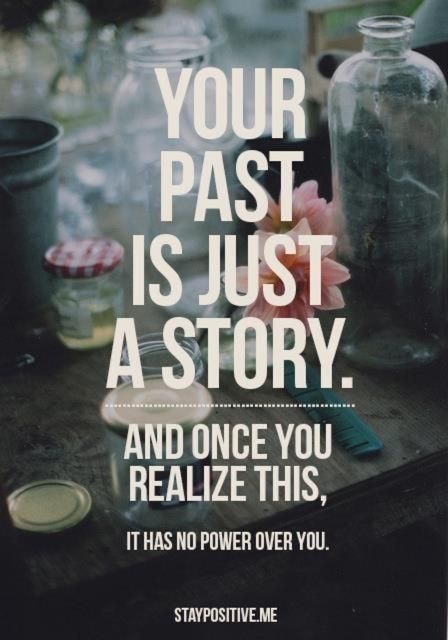 The thing is, our past has directly impacted our story, and because of that will always have power in our lives. Instead of shunning it, take the power and use it to continue writing your journey. Eric Sheninger has said, “If you don’t tell your story, someone else will.” This is in regards to being a connected educator, and digital leader for your schools/districts. I’d argue, however, that it applies to each one of us. That doesn’t mean that we all need to get on every social media platform to tell our stories. But, I would urge each of you to share your story with someone. I once had a great friend tell me that she could see God asking me to share my story with other women at some point in the future. I remember thinking, why on Earth would anyone want to hear about my pain, mistakes, heartaches? What do I have that could possibly be helpful to someone else? But that’s the thing. We all have pain, mistakes, and heartaches somewhere in our past. And those events have each shaped our present lives, and will impact our futures. By sharing my story, maybe someone will feel less alone. While I agree, that we shouldn’t let past inflictions continue to hurt us in the present, there is power in learning, growing, and in becoming because of these. There is power in every chapter of my story. There is power in every chapter, every sentence, every word, of your story. Who and where do you tell your story? Or with who will you share it for the first time? I tell my story to my children. I talk about my life, past and present. I share my dreams for the future. And I try to help them sort out the “stuff” they encounter each day so that they can be stronger, happier, and wiser because of them. I hope that I’m teaching them to take ownership over their own lives, even at their young ages. I share my story with close friends and family who walk through my life with me, grateful that they are a part of the story. I provide snippets of my story to strangers and social media peeps through this blog, Twitter, LinkedIn, Facebook, etc. Why? I value reading other people’s stories, and hope I can add value by sharing mine. I don’t believe in “FaceBook Fairy Tales”, but I do believe in people being real. I tend to trust people pretty easily. I end up sharing some personal aspects of “my story”. Sometimes that has left me hurt, but that’s proven to be the exception. I have made some great friends by sharing my life with them. In turn, I listen to their stories. Giving voice to your past, gives you the power over the story. How will the story end? That’s the fun part of the adventure.